BBC Advice: Coming outThe cast also includes Thirteen Reasons Why's Katherine Langford, with Jennifer Garner and Josh Duhamel as Simon's parents (more on Jennifer later and the line she came up with that people are now turning into tattoos). "It's really special, and it's been so humbling," Becky says. "But most of us were kind of surprised to realise that it was the first of its kind. It just seems like that shouldn't be the case in 2018. There should have been a lot of films like this! It's just a sweet rom-com. "It's exciting to be a part of that, because you hope it will open the door and there will be more and more. But it's good to get the ball rolling to what I hope is a new era of films moving forwards. "It's a lot of responsibility though and everyone involved feels the weight of that. It's hard because this story is just Simon's story. And then you see a lot of [director] Greg Berlanti's personal story - it's a passion project." She's keen to stress that the story won't resonate with everyone though. "Like any story, it's going to really resonate with some people, but it's not going to be the same for everyone," she says. "Because it's the first film of its kind, some people go into it expecting it to be really universal and it's important to recognise that no story can be universal. "Because of that, it needs to be a film that's one of many. "The film is proving to be inspirational to audiences, Becky said. "I've heard from a lot of people - from teens, from adults - and a lot of people have come out after seeing this film," she said. "I've had that as well after people have read the book. That's from halfway across the world too, people from different countries, different people in different circumstances. "It's incredible to see how much it means, that even the existence of the film is such a statement. "What I've heard from people is that from the film they get the feeling that it [being gay] isn't just a normal way to be, but also something that should be celebrated and brings much joy. That's part of the core message of the film - that everyone deserves a great love story." Many people have said what especially resonated with them is a speech made by Jennifer Garner's character to Simon in which she tells him in a crucial scene - "you get to exhale now". "She wanted that scene to be added," says Becky. "That actually came from Jennifer. She was already my ultimate mom hero. But now I've heard of people getting tattoos of the word exhale. Some have asked me to do it in my handwriting, but it's not my line - I wish it was!" Becky used to work as a clinical psychologist, specialising in working with teenagers. While she saw a lot of people from the LGBT community, she stresses that none of Love, Simon was based on any of her patients' experiences. "That would be so unethical," she says. "Everything about my former career is off limits. "But because of my background, I got to a place where I had a pretty thorough understanding of what some of the issues some of the people in that community were dealing with. For personal and professional reasons, that community is important to me. "One of the ways I try to explain my purpose for writing the book is that it's like a love letter to them. The stuff that so many of them have to go through... I'm so in awe of those teens - they're just the coolest, most awesome people." 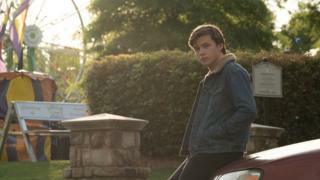 Love, Simon is on general releaseFollow us on Facebook, on Twitter @BBCNewsEnts, or on Instagram at bbcnewsents. If you have a story suggestion email entertainment.news@bbc.co.uk. » Can you recycle wrapping paper? » Could you brave an 'immersive horror' show?